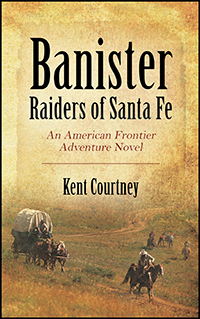 Kent Courtney’s “Banister – Raiders of Santa Fe: An American Frontier Adventure Novel.” The Banister Family was one of the earliest settlers in the original colonies and it seemed that Banister blood had a strong desire to push the limits and see what was beyond the mountains or the sea. This book blends American history with the saga of a fictional family revealing what it was like to face multiple, seemingly unsurmountable challenges and surviving against all odds on the frontier. The series offers relevant, realistic historical fiction with real places and events woven into exciting story lines. Next Next post: Take Your Book Stratospheric With a Free Amazon Launch Bundle!